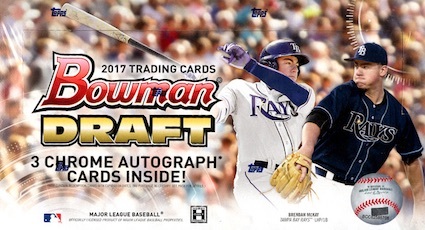 Offering the earliest MLB-licensed cards for the '17 draft class, 2017 Bowman Draft Baseball helps finish out Bowman prospect collecting for another year. Hobby formats include Jumbo with three autographs and Super Jumbo with five autographs per box. 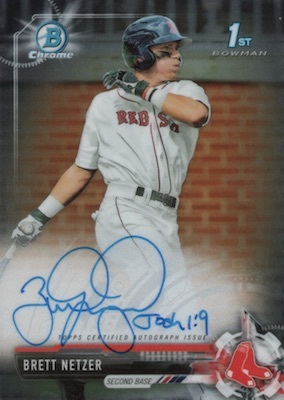 Headlined by even more Chrome Prospect Autographs to chase, the 2017 Bowman Draft Baseball checklist picks up from 2017 Bowman Chrome and the main Bowman sets from earlier in the season. Featuring up to 200 cards, and the first options for the 2017 draft class in their MLB uniforms, the base set consists of both paper and Chrome versions, with the applicable parallels to build your rainbow. This includes new Purple Border paper and Bowman 70th Logo Refractor chromium editions. Jumbo is the only place to find Orange Border (#/25) paper, Sky Blue Refractor (#'d) and Orange Refractor (#/25). 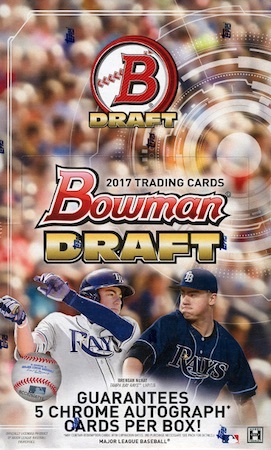 The full 2017 Bowman Draft Baseball checklist breakdown is provided below for the base paper and Chrome parallels. 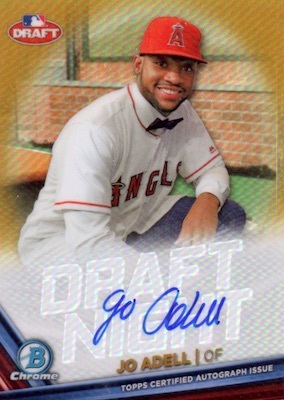 There are also new Image Variations for the key draft picks and prospects with on-card Autograph versions available, as well. 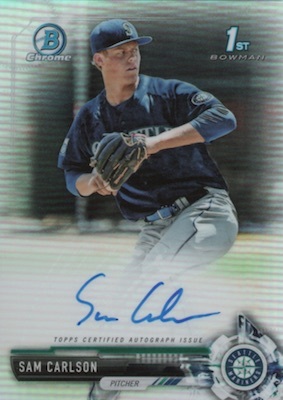 Bringing some of the best '17 draftees, the hard-signed Chrome Draft Pick Autograph cards let collectors look into the future for the next MLB stars. 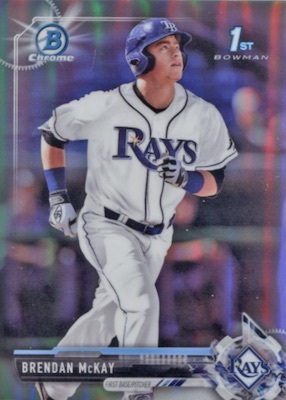 Base versions are joined by lots of shiny parallels including Black Refractor (#/75), which is only found in hot packs of 2017 Bowman Draft Baseball Jumbo. In addition to what is listed below, there are also low-numbered Wave Refractor editions. 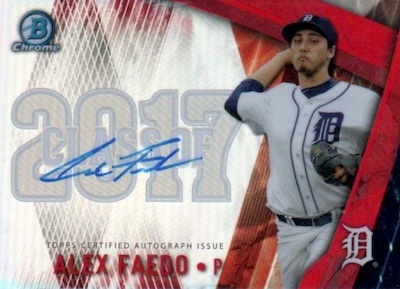 A new case hit in 2017 Bowman Draft Baseball, the on-card Class of 2017 Autograph (#'d) set zeroes in on the first-round talent with limited parallels. Going a step further is the incremental content in 2017 Bowman Chrome Baseball. Encapsulating stars from their high school years, the long-running All-America Game Autograph line returns for another go with one-of-one Gold Framed parallels. 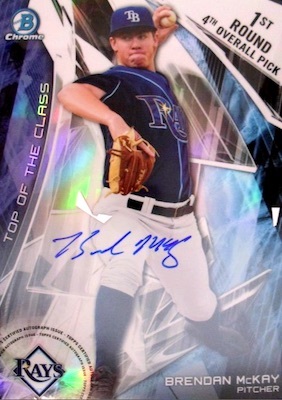 Meanwhile, numbered Top of the Class Box Toppers are exclusive to Jumbo boxes. These have Gold Refractor (#/50), Red Refractor (#/5), SuperFractor (1/1) and Autograph Orange (#'d) parallels. Bringing the product to a close, several themed inserts occupy the remainder of the set. 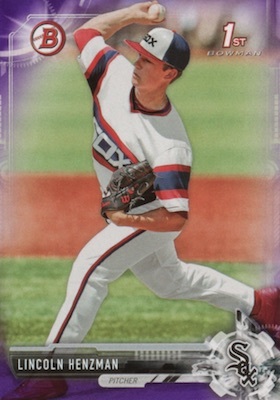 Bowman Defining Moment identifies key signs of greatness in top prospects, while MLB Draft History looks back at the formative years for former greats. Both include on-card Autographs limited to 99 copies or less. 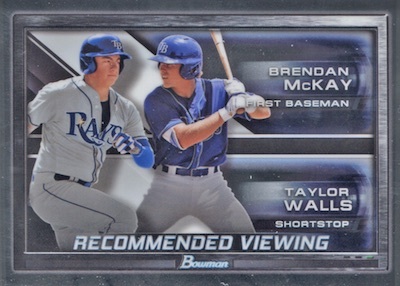 There are also Recommended Viewing cards that showcase two notable prospects from the same team. Each of the three inserts adds Refractor (#'d), Gold Refractor (#/50), Red Refractor (#/5) and SuperFractor (1/1) parallels. Lot 6 2017 Bowman Chrome Draft Class of 2017 Autograph Jake Burger Auto 250 !! 200 cards. Shop complete base sets on eBay. PAPER PARALLELS: Silver #/499, Purple #/250, Blue #/150, Green #/99, Gold #/50, Orange #/25 (Jumbo), Red #/5, Black 1/1, Printing Plates 1/1. REFRACTOR PARALLELS: Base Refractor, Sky Blue #/399 (Jumbo), Purple #/250, Bowman 70th Logo #/200, Blue #/150, Green #/99, Gold #/50, Orange #/25 (Jumbo), Red #/5, SuperFractor 1/1, Printing Plates 1/1. Serial numbered #/99. Shop on eBay. 76 cards. See the full guide and gallery. REFRACTOR PARALLELS: Base Refractor #/499, Purple #/250, Blue #/150, Blue Wave #/150, Green #/99, Black #/75 (Jumbo Hot Packs), Blue Bowman 70th Logo #/70, Gold #/50, Gold Wave #/50, Orange #/25 (Jumbo), Red #/5, Red Wave #/5, Black Wave 1/1, SuperFractor 1/1, Printing Plates 1/1. 5 cards. Serial numbered #/199. Shop on eBay. PARALLEL CARDS: Gold Frame 1/1. PARALLEL CARDS: Refractor #/250, Gold Refractor #/50, Red Refractor #/5, SuperFractor 1/1. 14 cards. Serial numbered #/99. Shop on eBay. PARALLEL CARDS: Gold Refractor #/50, Red Refractor #/5, SuperFractor 1/1. 30 cards. 1 per case. Serial numbered #/250. Shop on eBay. 5 cards. Serial numbered #/99. Shop on eBay. 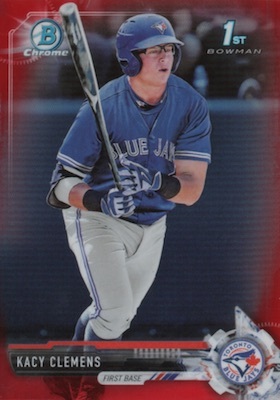 PARALLEL CARDS: Red Refractor #/5, SuperFractor 1/1. 15 cards. Jumbo Box only. Serial numbered #/99. 11 cards. Jumbo Box Only. Serial numbered #/35. Here are the top deals on hobby jumbo boxes currently listed on eBay. Here are the top deals on hobby super jumbo boxes currently listed on eBay. Good: Pretty great signers list from 2017 MLB Draft; Chrome rainbow shines again; decent color per box and many Refractors. 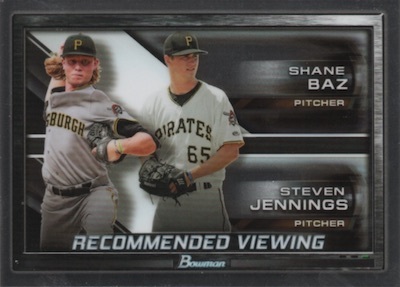 Bad: Jumbo-only format feels geared to the hit chasers; tons of cards but very little variety; yet another variation set. 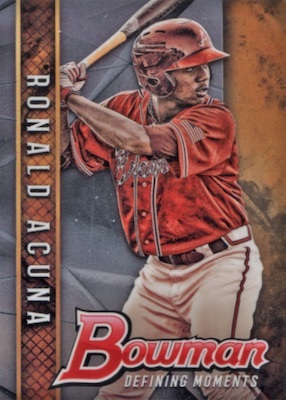 The Bottom Line: Although not the most exciting release when it comes to design, it is hard to complain about what 2017 Bowman Draft Baseball offers. The end-of-year prospect set delivers many top draft picks and lets collectors continue their hunt for the next big thing. Let's be real here. 2017 Bowman Draft Baseball is about color and autographs. Of course, that's fine, but the jumbo format and mounds of base cards make the rest of the set feel like an afterthought. 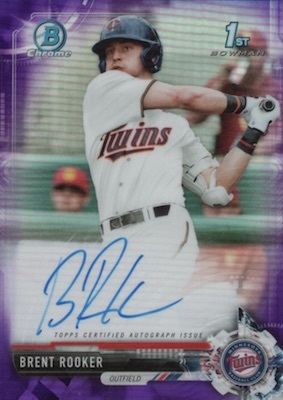 Hard-signed cards are always a plus and remain a staple of the Bowman brand. 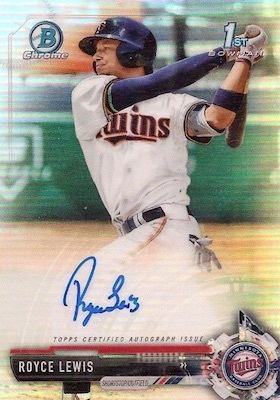 Bowman Draft paper is Bowman Draft paper and it makes me appreciate the Chrome even more. The big takeaway for me with this jumbo format is the stacks upon stacks of cards, but very little by way of design differences. The majority of each box is the Bowman design carried across the collecting season. Otherwise, there's Defining Moments, which features a fractured background and darker, earthy colors. I like it and the on-card autograph version. MLB Draft History, while not so much my speed in terms of design, is a cool way to revisit all-time greats as they entered the league. I think the main issue for me is the thick, green frame. However, the blurred background does a good job drawing attention to the player image. And then we have more variations that feel a little forced. Too many releases are going this route and it adds nothing in this set for me. At least they are fairly rare. It can also be very confusing to feature facsimile autographs in a set that is based around real autographs. The variation autographs I can get on board with if it is kept reasonable. When you really break it down, the 2017 Bowman Draft Baseball autograph checklist is strong. The 2017 draftees include 13 of the top 14 picks, missing only Hunter Greene (#2 overall). 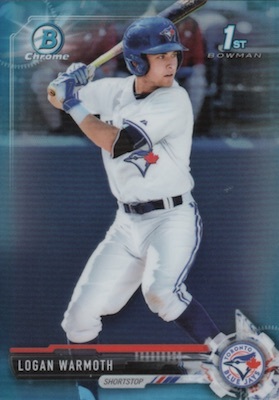 Sure, it would have been nice to get Greene in here, and maybe even Rhys Hoskins, but Topps delivered quite well. Evening things out, there are many other signers outside of the first round, but the majority are still from the first three rounds. 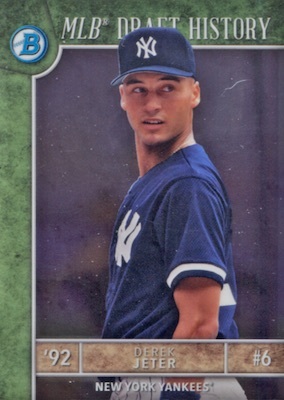 Bringing up the MLB Draft History cards again, not only is Jeter a signer, but his card is numbered to 99, which is a shockingly high print run given so many of his autographs seem to be 10 copies or less. 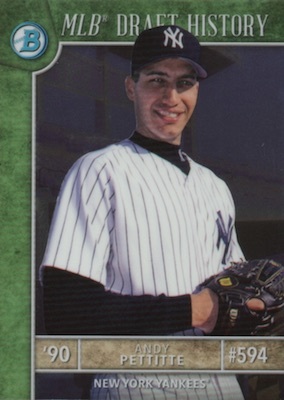 This is a nice non-prospect addition, as are the signed cards for Andy Pettitte, Randy Johnson, Rickey Henderson and Ryne Sandberg. Like nearly every other aspect of this set, value mainly comes down to autographs and color. Three on-card autographs per box for around $140+ is somewhat steep, and a pretty big gamble, but the payoff can be huge. Our review box benefited from two numbered autographs and a base Chrome Red Refractor (#/5). They don't all deliver this way, but the value is there, which is why box prices have held pretty firm. On the one hand, the jumbo packs can be amusing and the anticipation about what is waiting amongst those middle cards is quite exciting. The format does, however, seem to marginalize the top and bottom portions. 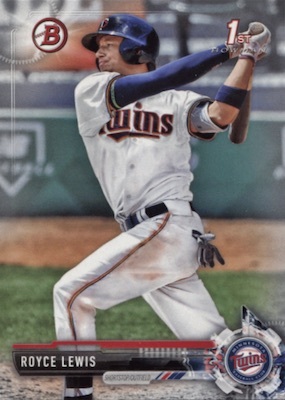 I do like that Topps continues to tinker and hope they can return to a standard format to go with the jumbo, and perhaps throw in a few more new options that don't center on variations. Blayne Enlow 2017 Bowman Chrome Draft Gold Refractor RC Autograph 19 50 PSA 10! 2017 Bowman Draft Brent Rooker Blue 70th Refractor BGS 9.5 10 Auto 70 RC Subs! A checklist that is full of the 2017 draft class and just a handful of prospects from previous years. This looks like a VERY strong showing from Bowman. CAN’T WAIT! Finally there is a Eloy Jimenez card in a White Sox uniform but no autograph??? Bowman and TOPPS filled their recent products with Cubs Eloy autos but now that they finally got their act together, no autos. I guess it doesn’t matter what the collectors want. I have a question, which really needs a quick response (If you don’t mind, I’d really appreciate it). 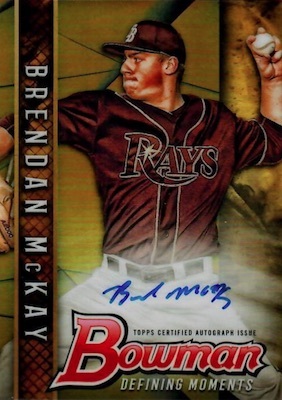 So I’m thinking of bidding on an 80 Jumbo Box Break for just Brendan McKay Chrome Cards. Meaning that I do NOT get the base cards. 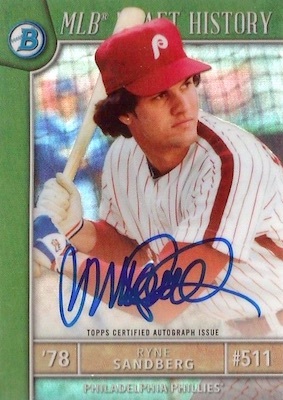 In the 3 auto’s/box, does that include Paper Autos. Are there even going to be Paper Autos. This is important. I’m not bidding $500 if there are. Any info you have would be greatly apprec. The checklist provided by Topps is what is listed, and it makes no mention of Paper Autographs. Thanks for the quick response. Any advice w/this type of break investment? Did a box reg jumbo got 4 autos. 3 of them #. I got a erorr or no# is it a SP? Made a set out of paper and got lots of chrome. Great box. I bought a Super Jumbo box and actually got a sixth auto: a Royce Lewis Purple Chrome Refractor Auto. But even without that gem of an insert, I would give this product a 5/5. Very pleased. I came 15 or so cards short of two full paper sets, plus 145/200 of the base chrome set. But I did find two odd cards that I wasn’t sure about. I got two Chrome cards that did not have the card number on the back (the BDC-# number). Neither is serial numbered, and the Topps code is the same as the other Chrome cards. The image matches the paper card, so it isn’t an image variation or facsimile auto. Any idea what these cards might me? The players are Taylor Ward and Wuilmer Becerra. Thanks! Hi, Corey. After reading your post I would just buy 500.00 worth of McKay cards. The auto checklist is over 75 cards. That doesn’t include all the other different auto sets in the product. Another thing to consider is just waiting the product out because right now it’s new and hot. These cards will all go down in price before they go back up. 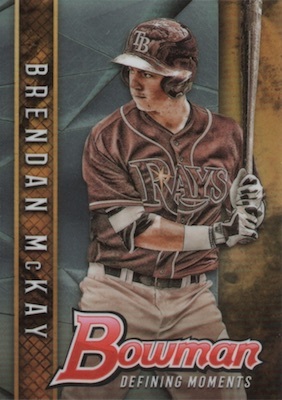 Also, being that McKay plays for Tampa rather than New York his cards will be very reasonable soon after 2018 topps series one comes out. Thats only a couple of months away. Hope this helps. I love your website . Especially your vintage reviews . But reading all your articles on the new stuff kinda gets me going again . Anyways you do a great job . You know your stuff . Bug fan out of San Diego !!! Always liked Bowman and this is no different. I did pull a couple chrome cards with no numbers. The regular has number matching list but same image in chrome numberless. Can we expect more errors?